Simplify the Calendar for Your Families and Yourself! As I look back and try to understand why we’ve grown, I’ve noticed that simplifying the calendar may have helped. I think maybe this is because our families felt healthier, parents felt more confident, and students less distracted by a busy church calendar. Furthermore, simplifying the calendar helps me stay focused on some of the things that I feel are more important. Take a look at the calendar pictured above. 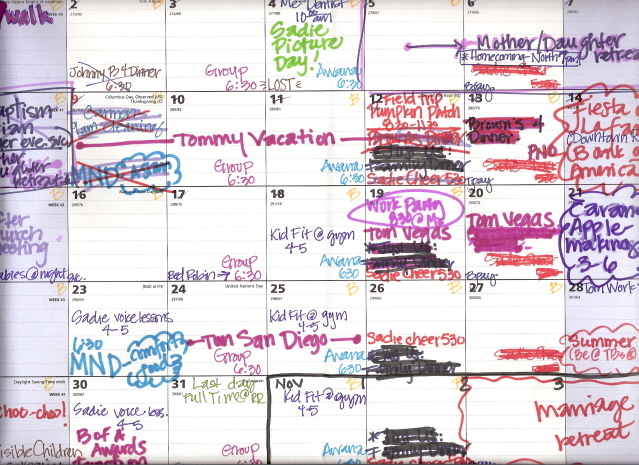 This is what the calendar looks like for most of our families. Do we really want to be contributing to their busyness. I don’t. I think we should be contributing to their health. Early on in my time at this church, we decided to pull the high school youth group off of Sunday nights and back onto Wednesday nights. We still kept middle school and high school separate by having the high school group meet after the middle school group. This was greatly helpful for families and they really appreciated having church on just one night a week. However, it was proving to be too late of a gathering for many of our high school students who valued time at home to do their homework before they went to bed. And, we still weren’t meeting our potential attendance. So…we remodeled the church garage into a youth room for the high schoolers and ran middle school and high school youth group simultaneously. This made for some logistical challenges for me personally, but it was worth it. This forced me to decentralize leadership and put real responsibility into the hands of capable lay leaders. Other people led games. Other people led discussions. Other people led music. Other people would sometimes even do the teaching. But all that work is worth it. Now, we have three age groups (Middle School, JV, and Varsity) meeting at the same time on the same night as our children and adult ministries. All ages of the family (adults too) have opportunities at the exact same time on both Sundays and Wednesdays. We also simplified the family calendar by reducing the number of social activities and special events we sponsor. When our ministry was smaller, it was great to have different events, trips, and activities that fostered community. Many of you have smaller churches and these activities are vital to the development of your ministry. They help you build community. They provide opportunities for you to know your students. They help you build a sense of identity as a group. But please know that it does have an impact on your families’ calendars. Do you really need to do all of them? Or can you maybe just attend something that they already have going like a basketball game, a choir concert, volunteer with Prom, attend the school lunch? You can build some really great relationships with students without adding to the busyness of their calendars. As we grew, we had to remove all the social activities from our calendar in order to simply the family calendar and so that I could stay focused on Sundays and Wednesdays and do them well. After all, that’s the gathering I really want to focus on.